If you are currently separated or going through a divorce, consider life insurance as part of a divorce settlement. However, if your divorce is already finalized, there are still some steps you can take. Being a single parent is tough. Managing school schedules, working full time, and handling all household responsibilities on your own—these are just a few of the things a single parent has to balance. If you receive some form of alimony or child support from your child’s biological father, then it’s bound to make things a little easier. But what if that very necessary monthly check just stopped one day? It’s every single mother’s nightmare, but in some situations even the court cannot help you out. If your ex-husband or the biological father of your child(ren) suddenly dies, your monthly income will drastically decrease. There is something that you can do to protect your family and prepare for the unexpected. By purchasing a life insurance policy you help to secure a stable future no matter what circumstances arise. As a mother, you are more than just a caretaker; you are also a breadwinner and a provider. In the very unfortunate circumstance that you die prematurely, there’s nothing you can do to make up for the absence of your love and care. However, there is something you can do to make sure that your children still have some level of financial security. There are many types of life insurance policies, however, if your primary concern is to find a life insurance policy that will keep your children financial stable in their growing-up years, then you may want to consider a term life insurance policy. This will cover you for a certain period of years. Different providers and policies offer different amounts of coverage, depending on how much coverage you would like to have and you can afford. It is in the best interest of your children that you get at least some type of life insurance until they are adults. Who will access the money if you die? Your ultimate goal is to make sure that your children are the ones who benefit from your life insurance policy. While setting up your life insurance policy, you can take precautionary measures to insure that your policy money is wholly utilized for the needs of your children. One great way to accomplish this is to name your living trust as the life insurance beneficiary. If you are receiving some kind of financial help in the form of alimony or child support from your ex-husband and/or the father of your children, then his early demise could potentially hurt your financial security. You may not know it, but in many cases, it is possible for you to take out a life insurance policy for an ex-husband or father of your children, even if you are not living together. Does he need to know that you are insuring him? Yes. You cannot purchase a life insurance policy for an ex-husband or father of your children without his knowledge. We know that things are often complicated in such situations, but unless you inform him, you cannot take out a life insurance policy for someone else. 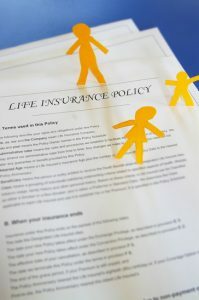 The best way to get him on board is to explain that this life insurance policy is for the well being of your children. It will help you to continue to provide for their basic needs to give them the best chance in life possible. Hopefully, your ex will put your differences aside and understand the value of purchasing a life insurance policy. Once he agrees, it may even be necessary for him to take a life insurance medical exam, depending on the type of policy you choose. What if you have no contact with him at all? If you are not in touch with the father of your children in any way whatsoever than that probably means you are not receiving any sort of payment from him. This is important because in order to take a life insurance policy on behalf of your ex, you need to prove that you are financially benefiting from him being alive. We mean to say, you must be receiving some kind of financial support—usually either alimony or child support—from your ex in order to be eligible to purchase a life insurance policy for him. Will he be financially liable for the life insurance policy? The thought of being financially liable to make life insurance payments may deter your ex from wanting to allow you to take out a policy against his name. It is important to assure him that this is simply not the case. If you are the one who has purchased the life insurance policy, then even if you fail to make payments, your ex will not be liable. Can a single father take out a life insurance policy for an ex-wife and/or the mother of his children? He must prove that he receives payments from his ex-wife/mother of his children (usually in the form of alimony or child support). He must inform her that he is taking out a life insurance policy for her. What is the best life insurance company for a single parent? Taking out a life insurance policy is far from black and white. There are dozens of great life insurance companies in the United States, each of which have their own strengths and weaknesses. There are many factors that go into deciding which life insurance company is best for each situation. The factors one must consider before choosing a life insurance company primarily depend on the life of the person looking to get insured. In this case, your ex. Compiling all of this information and then cross-referencing it against what different companies offer in various policies is a humongous task. The best way to figure out which life insurance company offers the best policy for your situation is to speak with someone who has a thorough understanding of the life insurance industry. Usually, these experts have vested interest in promoting one life insurance company over another. Fortunately, that’s not the case with TermLfie2Go. We are an independent organization with absolutely no interest in getting you to buy a life insurance policy that’s not right for you. That’s because we don’t work for a life insurance company; we work for you. We start by understanding your situation and your needs. We then learn about the person you are looking to insure (either your ex or you). Then, we carefully choose life insurance companies and policies that will work best for you. We present you with these very customized recommendations and let you make the final decision. Thank you for reading our article, Life Insurance to Protect Alimony and Child Support. Please leave any questions or comments below. Looking for a policy to protect my alimony payment on my ex husband. It is part of the divorce decree ordered by the judge. We can certainly help you out with this. We’ll have one of our agents who specializes in these types of life insurance policies reach out to you right away.